Get the answers to your questions about the new site redesign. Q. What’s changed on sgvtribune.com? Sgvtribune.com introduced a new website design that includes a cleaner presentation, simplified navigation, enhanced functionality, and greater interactivity as it relates to sharing and commenting on stories. Q. Why did you launch the new web design? The updates mirror how people are using Sgvtribune.com and bring additional accessibility to the type of content they’re searching for. We believe the new site is more responsive, easier to use and facilitates more interaction with our content, journalists who produce it and the community. Q. Why did you change the navigation of the site? Our staff spent a lot of time analyzing how users were using our old sites and how they were searching for content. We built the navigation with that in mind, and simplified the navigation menus so information would be accessible through one click instead of several clicks. Q. How do I manage my account online? The links for Subscriber Services are now located at the top of the page and in the footer (bottom of the web page). The Subscriber Services area is where users can log into their account to place a vacation hold, pay their bill, access other subscriber-related services and take advantage of our Reader Rewards offers. Q. Did you move all of the content from the old website to the new website? Yes. All articles that were on the old sites were migrated over to the new sites, but might land on different pages. There will be url redirects to anything that might be bookmarked or linked to old urls. Select graphics and non-article news content did not migrate into the new site. Q. Where can I find news updates and up-to-the-minute news? Up-to-the-minute news updates are easier to find. A new "Latest News" column is found in the center of the home page. A "Most Popular" box will display six articles that users are finding most interesting on the site, and a "Trending" bar at the top of the pages will have must-read items selected by editors. A new yellow "Breaking News" bar at the top of the homepage may also appear when there is an urgent, can't-miss story. Click here to subscribe to the Breaking News newsletter and alerts. Q. Where can I find news about my city? The Local News dropdown menu in the main navigation. Q. There's no longer a Lifestyle or Entertainment tab. What happened to that content? We merged “Lifestyle” and “Entertainment” under the “Things to Do” category, which better reflects what readers are looking for. You’ll see direct links to more local entertainment, activities, and hobbies -- whether that’s planning a road trip, a family movie night or a drought-tolerant garden. Q. Where can I find the Obituaries? There is a link to the Obituaries section in the navigation list that runs across the top of the site on desktop or under the pop-out menu on the left side on mobile. Q. Where can I find weather and traffic information? Toward the bottom of the site near the footer. Looks like there’s going to be some bottlenecks on our freeways and it’s going to be sunny tomorrow. Q. Where is the e-edition? 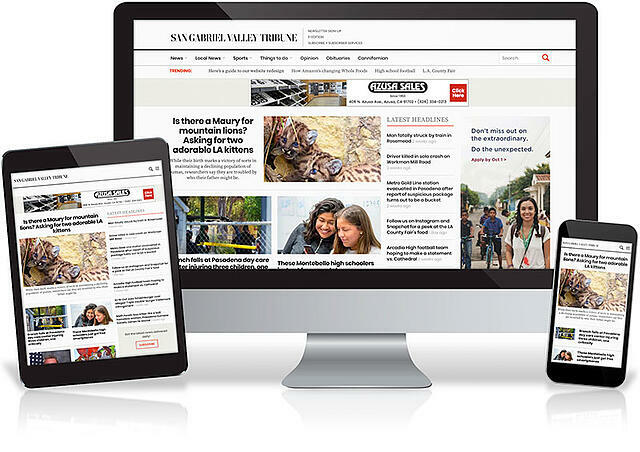 There is a link to the E-edition at the top of the site on desktop version beside the San Gabriel Valley Tribun logo. Q. Did you remove comics, games, horoscopes from the new website? Yes. We were paying money to outside vendors to pull that content into our sites, but they had very small readership. So, we decided to use those resources on our local journalism instead, which is what most of our readers are seeking us out for. To enjoy similar games and puzzles please visit one of our partner website- click here. Q. Can I share stories I read from my desktop or mobile device? Yes. There are share buttons and icons at the top of the screen to help users share the story on their social networks or by email, to eliminate the need to scroll up to get back to a share button. Q. Can I comment on stories from my desktop or mobile device? Yes, our commenting platform is easy to use (via a blue comment icon at the top and bottom of articles on desktop and mobile versions of the website) and allows you to comment on articles. It provides real-time discussions within article pages, and includes upvotes, downvotes, threaded replies, recommends, and more. Rich-media-supported comments let you add images and video to keep discussions lively. Readers may also follow interesting commenters to find even more communities to participate in. Notifications allow readers to know when others are responding to their comments. Users can easily sign in to the comment tool right on our site using either an email address, Facebook or Twitter. Q. Someone is making inappropriate comments in articles. What do I do? We encourage all of our readers to use our commenting platform to engage in insightful conversations about issues in our community. Although we do not pre-screen comments, we reserve the right at all times to remove any information or materials that are unlawful, threatening, abusive, libelous, defamatory, obscene, vulgar, pornographic, profane, indecent or otherwise objectionable to us, and to disclose any information necessary to satisfy the law, regulation, or government request. We might permanently block any user who abuses these conditions. If you see comments that you find offensive, please use the “Flag as Inappropriate” feature by hovering over the right side of the post, and pulling down on the arrow that appears. Or, contact our editors by emailing moderator@scng.com. Q. How do I contact someone in the newsroom, advertising or circulation? Access our Contact Us page, found within the About Us links in the footer at the bottom of the website. Q. How do I contact a writer of an article I just read? At the bottom of each story you will find a small biography about the reporter, as well as contact information and links to other stories by that reporter. Q. Can I receive new updates from your website by email or social networks? Yes. Get the latest news delivered daily by signing up for email alerts, or accessing our social media accounts below. Q. Do the desktop and mobile websites load faster now? We would love to hear back from you. Please feel free to let us know what you think.